Seven people died when a three-story building collapsed in heavy rains in western India, an official said. 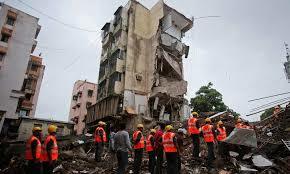 The dilapidated building crumbled on the outskirts of Indian's financial capital Mumbai late last night. “So far we have rescued 10 injured and removed seven bodies while three more are still missing,'' National Disaster Response Force official Alok Avasthy told AFP. “It was an old structure that had been declared unsafe, yet four or five families continued to reside there,'' Avasthy said, adding that monsoon rains were hampering the relief effort.